Remember when Madiba turned 88? I was going through some of my old columns I wrote for the Pretoria News and came across this one, which was published on his 88th birthday. I thought I’d share this with you as we keep Tata, who is still in hospital, in our prayers. Let’s also all do our 67 minutes of community service as we celebrate Mandela Day on his birthday next week Thursday. Have a great weekend. Today, former president Nelson Rolihlahla Mandela turns 88. He and Graca Machel are also celebrating their eighth wedding anniversary. It is indeed a special day for Madiba and his family. But, it is also a special day for people around South Africa, and in fact around the world. We need to pay special tribute to him as he celebrates his birthday. Mandela is the father of our nation. He is our living icon. As a leader, he is respected around the globe. Madiba holds a special place in the hearts of millions of people. In the run up to his release, after spending 27 years in prison, few people could picture the face of Mandela. I clearly remember the day when he was released – Sunday 11 February 1990. I was working as a reporter and was deployed to the Grand Parade in Cape Town for his first public appearance. Those visuals will remain with me for the rest of my life. This was the day that changed the face of South Africa. 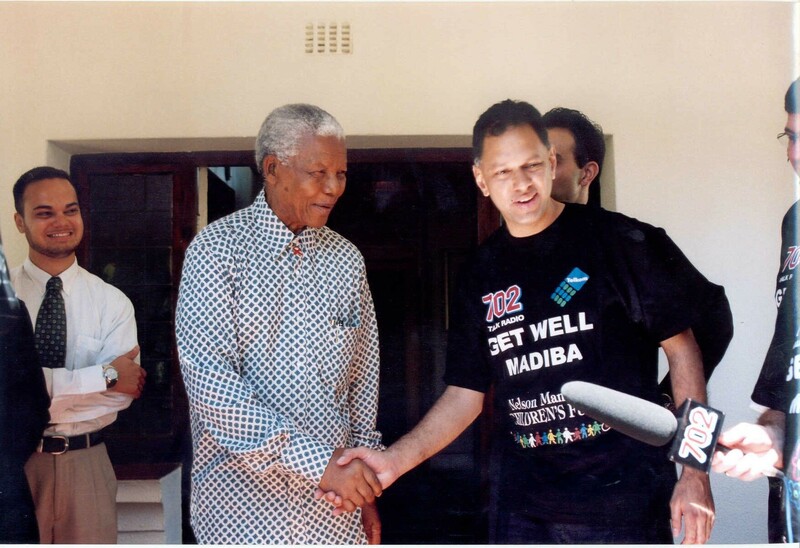 Over the years I’ve also had the honour of meeting Madiba, both in private and in public. This is a remarkable man. He is a true human being. He is kind, sincere and humble. For many he will always remain as one of the best loved heroes. Three specific meetings with Madiba come to mind. I was part of a small group invited to enjoy breakfast with him at his official residence in Pretoria before he retired as our country’s president. Some years back he visited one of our radio stations, and last year I met him at his Houghton office to record an interview. On all these occasions he was razor-sharp and kept his sense of humour. He always conducts himself with grace, and his qualities of love, respect and care are constantly portrayed. Despite being retired, the plight of South Africa’s people remains close to his heart. Whether it is the building of schools or clinics, assisting under-privileged children or creating awareness around HIV/Aids, Mandela is still active. His legacy especially that of forgiveness will remain with us forever. He left prison with no hatred or revenge, and extended his hand of goodwill to all South Africans. Many world leaders, especially those in countries where conflict is rife, can take a page out of Madiba’s book. You only have to read our newspapers or follow radio or TV news to realise just how lucky we are. While nations grapple with their futures, Madiba has charted a course for us that is the envy of many. Not in our wildest dreams could we have hoped for the country in which we now live. Sure there are problems, and there is work to do. However, think back to the time of Madiba’s release when South Africa was on a knife-edge. With all the racial divisions of our history, the possibility of a civil war was not far away. Thanks to Mandela’s contribution, we are where we are today. The former president never answered racism with racism. He brought peace to our land. We should never forget that he was the man who scarified his private life and his youth for all of us. We hope that Mandela really starts enjoying his retirement. He must continue to spend valuable time with his family. He needs peace and quiet. But, despite turning 88, Mandela is still young at heart. Tata, you are a man of wisdom. You are an inspiration to millions around the world. We will never forget your contribution to our country. South Africa is blessed to have you. We pray that you enjoy many more birthdays. Someone asked me at the weekend if I had one wish for Madiba, what would it be? Well, I hope and pray that he will be able to join our nation, and the world as we celebrate the staging of the 2010 Fifa World Cup on our soil. Happy Birthday and happy eighth wedding anniversary! The focus should be on Tata at this time. Nelson Mandela remains in a critical condition in a Pretoria hospital. The focus of the world remains on our country and millions of people are continuing to pray for Madiba and his family. The focus over recent days has shifted to the Mandela family and family feuds are now dominating the headlines. It’s sad, yes very sad. The focus should be on Tata at this time. But the family battles are taking precedence. It’s Mandela vs Mandela. Let’s hope the Mandela’s can resolve their differences and unite- for the sake of Madiba and his legacy. What would Madiba want? Unity, reconciliation, peace, harmony and happiness. Not feuds, conflict, disunity and unhappiness. Let’s also move our focus now to Mandela Day on 18 July. Let’s mark Madiba’s birthday with a common purpose and goal- that of making a difference in the lives of others. Let’s plan to do 67 minutes of community service. Let’s all Lead SA. As we countdown to 20 years of freedom on April 27 next year, let’s volunteer 20 hours of our time for good causes. Let’s start on 18 July and log 67 minutes of our time. We wish Madiba well and let’s all continue to pray for him. Let’s hope the family sort out their squabbles now and focus on Tata.